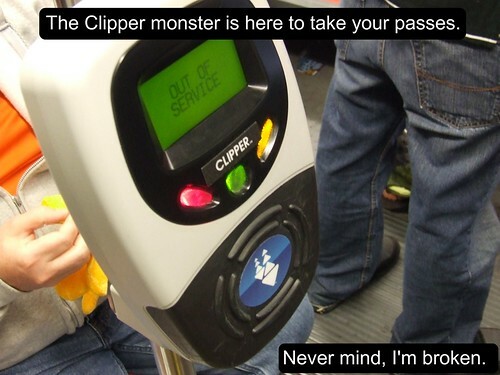 Don't forget to tag your Clipper card on Muni! Over the past couple of weeks, some news stories came up about people not tagging their Clipper card and either getting hassled by a fare inspector or getting a fat $100 ticket. Several hours ago, Muni Diaries heard from the folks at Muni that anyone with a monthly pass isn't required to tag their card. And at KRON Channel 4, Stanley Roberts (a.k.a. the guy who filmed the infamous elmo shirt rant) did a couple of video segments of fare evaders getting caught for not paying their Muni fare with Clipper and getting a big $100 ticket. (First video on top of blog entry, and second video on bottom of entry). We all should know by now, fare evasion is a bad thing to do, and sets a bad example to the rest of the public ("hey, monkey see, monkey do!"). I've mentioned it a few times back when the brand new Muni fare gates had a "glitch" in which people could use their hand to open the gates and gain free entry. For those of you paying for Muni with the blue card using e-cash or an electronic token ridebook, tagging is mandatory every time you board. Don't do it, you'll eventually get caught. Pro tip #1: Always tag your card correctly. Getting the error tone means you card is NOT VALIDATED! Don't swipe, hold and wait for confirmation. But as Muni Diaries mentioned, what about monthly passes? Good point. Muni's policy is not to cite people, but the fare inspector has to sift through the data on your card to find out if you have a pass or not; and that means wasted time. But this is only for the metro service. Not tagging on a bus or F-Market streetcar could get likely in trouble with the operator as passengers are supposed to board the front door and either pay cash, show the transfer, or tag their Clipper card. Even then, tagging your card is highly encouraged; not just to avoid wasting time with an inspector, but it also helps Muni gather ridership data. When they do an assessment, they have hard proof to the state and federal government that the money they are receiving is not enough based on the ridership numbers. They can also use the data to find out about usage patterns; say if at 9PM at night, there's a high volume of tagging on the 1-California line, that could indicate to Muni that an extra bus might be needed to run. But it could run negatively to help support reductions of service for a line as well. Pro tip #2: If the metro train's card reader is not functioning, go to the other half of the car; the "A" car's Clipper card readers are independent from the "B" car's. Fare inspectors should hang out on the 5, 31, and 38 more. Lots-o-cheatin' going on there!